Five thousand years ago — like, very nearly when they think Stonehenge was built — and for five hundred years afterward, the monument was used as a burial site. They’ve known this for a long time. Excavations in the early Twentieth C uncovered lots of bone fragments that were, in an unusually wise move for the time, reburied for later generations to examine. That’s us, with our fancy pants machines. The bodies were cremated, so there’s no DNA analysis or anything like that. But they can do that new thing where they analyze the strontium signature to tell where a person’s from. No, I don’t really understand how that works. Well, in this case, because of the condition of the fragments, they can only tell where the person spent the last ten years of his (or her) life. This is the interesting bit. 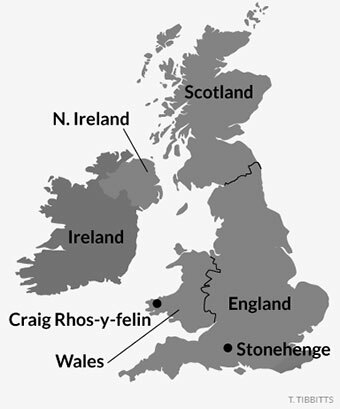 Of the 25 individuals they’ve identified, 15 came from the area around Stonehenge, and 10 came from West Wales. Yeah, where the bluestones come from — those very early stones in the henge. The ones they’re always trying to figure out how the hell they moved them so far. They think they’ve identified both men and women, and they say high-status individuals — though you have to wonder if that last bit is speculation, unless there’s something they can tell about diet or bone wear. The story has appeared in several places right now, because the studies are new, but here it is from Science News. I love this stuff. And don’t even start on me with the druids. Druids were later, probably.